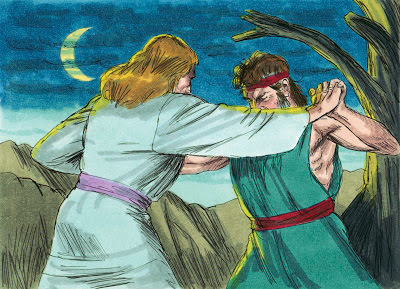 Jacob was wrestling with God. Obviously at any point Almighty could have pinned down Jacob’s body. However, as the Lord usually operates, He wasn’t after Jacob’s body, but his mindset and intentions. God wanted to pin down Jacob’s will. And so after wrestling all night long the Lord touched his leg and dislocated Jacob’s hip joint. Now we have reached the great turning point. Jacob turned from wrestling to clinging. When Jacob proclaimed he would not let go this was not an act of defiance, we can never force God to do anything, but now he wanted God like never before. Sometimes God just breaks you all the way down. When you don’t listen to what He says or follow His direction, God knows how to get your attention. When you keep resisting Christ He can get you in line with Him. Give in to the Lord before your turning point has to come this way. Just give in and win!